John Kerry For President 2008: Kerry Providing Leadership on Iraq! 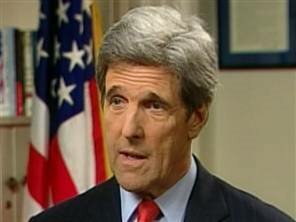 Individual supporting John Kerry for President in 2008. Discussion about Presidential Politics and the 2008 election issue. Red States. Blue States. This is an unauthorized blog not sponsored by the John Kerry or Democratic campaign and represents only my personal views. Kerry Providing Leadership on Iraq! America needs your leadership now more than ever! You have been to Vietnam and seen what happens when America stays on a path that cannot lead to victory. You know Americans are dying now in Iraq for a war that was unnecessary; a war that facts were "fixed" and where leaks of intelligence were used to destroy critics. "The bottom line is I think that Americans now see that Iraq is broken, our policy is broken, that the president has not changed course. And I think on that and a host other issues, from immigration to health care to their loss of jobs overseas, I think Americans are deeply concerned about the direction of the country." Senator Kerry keep on telling it like it is! "The bottom line is, I've said it any number of times in the course of the presidential campaign and since, that they misled America about how we went to war and this is one more example, concrete example, very clear, of exactly how they misled America." "It also says that when the president stood up in front of the American people and said, "This is against the law, and we're going to investigate and find out who do it and when I find out who did it, I'll fire them," he knew he was the one who did it. He was not telling the truth to the American people that day. "I think the policy in Iraq is broken, I think the president is stubbornly proceeding down a course where our soldiers are continuing to be maimed and killed, and it's wrong, and I think there is a better course. I think Americans understand, that whether it's their health care, their jobs, their schools, their communities, their commute, the traffic, the cost of energy or energy independence, I believe Americans understand we can be doing better than we're doing today." "That's all for the future. When that starts, the people in the party will make that decision. You know, I'm an expert about front runners and I never accept whatever conventional wisdom is and I don't accept it today. She's very strong, she's certainly the front runner, I like her, she's a great person. But I'm not even sure she's running and I'm not sure she's sure she's running. Let's wait and see where we all wind up after 2006, which is really what we ought to be focused on now." America is at a crossing-point. Do we recognize that we cannot solve every civil war, pre-emptively remove every dictator, export our brand of democracy to every corner of the world, and bomb countries into "friendship"....or do we recognize the errors of our ways and seek to fight terrorism without torture, rendition, illegal wire-tapping, obscene corrupt defense contracting, and lies to our own people? There is a better way John and you are pointing it out for the American people. This blogger is still with you. Together we can bring America back home, back to the ideals of freedom, and liberty, and understanding that once provided the rest of the world a beacon. America needs your brand of leadership now more than any time in the history of the Republic! He was also stellar on the Situation Room, as well as Meet the Press yesterday morning. I didn't think it was possible, but I agree with everything this man stands for. Everything. When John says he has learned from his mistakes -- he means it. You can just tell. I don't know who did it, but someone got through to him and his message is much sharper, and much more clear. I can't wait for '08 talk to pick up! You are so rite. I did not realise how great senotor kerry is. Pls remind me to add your site to my link's. I don't think he should be president, myabe VP. I am root for Hillary. I am a physician who also cares deeply about the health of our political system. and author of "Stock Picks Bob's Advice" blog on investing. Kerry to New Hampshire: Campaign 2008 Continues! Missouri Considers "Christian Nation" Resolution! Hillary for President in 2008! If you have questions, please feel free to Email me!.